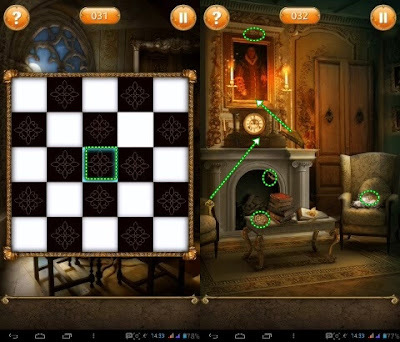 Press the chessboard on the table, then press each box that appears until a key appears on the table and use to open the door. Use scissors onto the cushion on a chair. Take all the wheels in chairs, tables, fireplaces, and paintings. Move the top of the clock, use the key to open the clock drawer, then use the key to open the door. Arrange the puzzle pieces to form flowers and hands. Tilt your phone to the left and right so that the lights and key fall to the floor. Use a broom to clean the lights on the floor and then use the key to open the door. Direct the arrow to the statue of the heart, then press the arrow to shoot until the key falls to the floor and use the key to unlock.